The Tool Chest is distributed to members of the HTPAA four times a year by mail. Most back issues are still available to members on a cost recovery basis from the Secretary HTPAA (refer to the "Office Bearers" page). 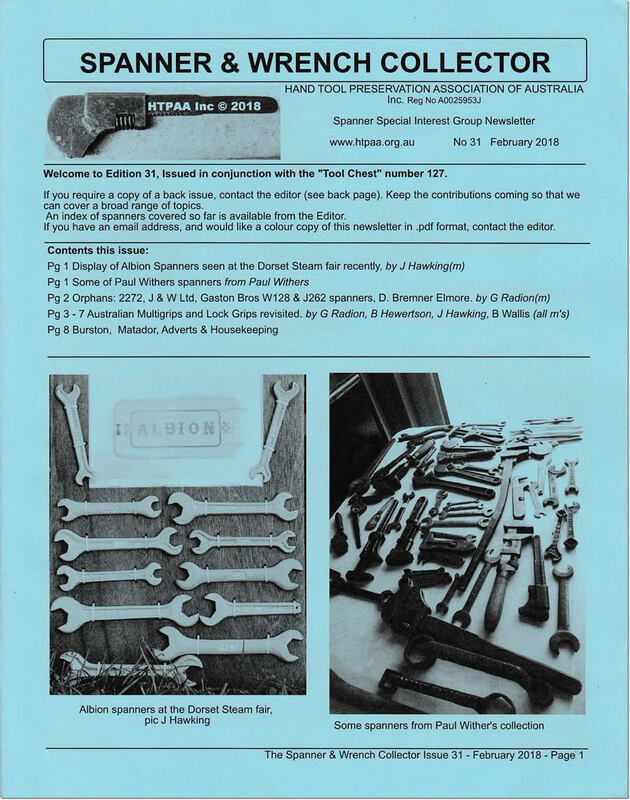 We are now able to supply copies of some articles from the Tool Chest and many back issues to HTPAA members, and members of the public located in Australia and overseas. Non-HTPAA members who would like copies of articles or back issues should contact the Secretary. Cost of back issues is postage plus: to members AUD $6 for single issues, $5 each for multiple issues and for overseas buyers $7.50 per issue. These charges are on a cost recovery basis. Be aware that all available back issues can be picked up from our regular bi-monthly meetings if arranged prior, for nil postage, and guests are always welcomed. The new look Tool Chest has been very well recieved by the readership. Coloured covers and inserts are now included as regular issue. See below for a link to see the new design Tool Chest. The Tool Chest includes original articles on aspects of tool collecting and maintenance, with particular emphasis on research into Australian tools. Also reviews of relevant publications, details of interesting finds by members, ongoing debates about tools and their use. The HTPAA is looking for interesting articles to publish in the Tool Chest. Members and others are invited to submit articles to the Editor for consideration. If you have a good idea for an article, or perhaps a collection to share with the readership, or a request for an article on a particular topic - please contact the Editor to discuss it. Some members have mentioned that they have an idea for an article or a collection to write about - but do not feel they have the writing skills to do it - the Editor is still interested in those stories - help can be given, coaching or assistance with writing an article is offered - the readership is sure to enjoy your article. If you have visited an interesting museum, collection or website that would be of interest to the readership - a review of the venue or a URL with a short note would be appreciated. The HTPAA is always happy to include links on our website to other websites that are of interest to the readership. Take this link to view a sample article: A History of Early English Adjustable Wrenches Found in Australia, by John Hawking, member HTPAA & Ron Geesin member TATHS from The Tool Chest - Issue No. 87. Handtools - Our Heritage is a 130 page booklet, containing the history of the HTPAA and 12 other articles on various aspects of tool collecting and conservation, published to celebrate the 25th anniversary of the HTPAA. See the cover, contents and purchase details here. 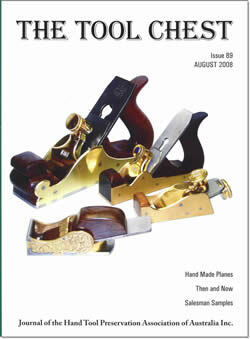 In the years since the first issue of The Tool Chest there have been hundreds of articles related to hand tools published. To get an idea of what is available see the Table of Contents Summary for Tool Chest Journals from 1989 to the present. You can also use the convenient Tool Chest Content Search facility to find specific topics. The Sharp Edge is a newsletter which accompanies The Tool Chest. It provides information on current events and forthcoming activities, dates, and venues, library acquisitions, classified advertisements, a calendar of events, and mystery items. 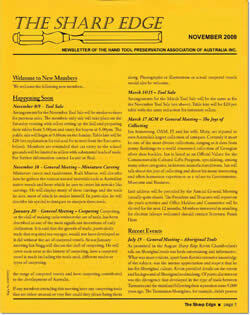 The Spanner & Wrench Collector is a newsletter which accompanies The Tool Chest. It provides information of interest to Spanner & Wrench collectors and users. It includes classified advertisements, interesting websites and forums, and a featured orphan spanner each issue. There is now an up to date list of articles contained in issues of the newsletter and these can be found in the Spanner and Wrench Collector Content Summary. From time to time the HTPAA publishes booklets such as membership & library lists and catalogue reprints. Oilcans - an original book by member Ralph Philpot, (additional copies available from the author only). These Special Publications are supplied to members as part of their subscription and are usually available for purchase by members of the public at Displays and Demonstrations attended by the HTPAA. Members and the public can also purchase most of these items (some are out of print) from the Secretary by mail.